Can women achieve true equality? Women have made huge strides in the United States since the modern feminist revolution began some 50 years ago. Women serve on the Supreme Court and as Federal Reserve chair, and a few run multinational companies like General Motors and PepsiCo. But scholars say women still have a long way to go before they enjoy parity with men. They lead only 21 of the nation's 500 largest corporations, hold less than a fifth of congressional seats and earn less on average than men for comparable work. In professional sports, female players are paid far less than men, even when they are more successful. 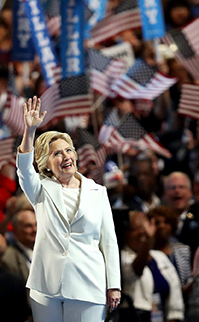 Women's advocates are looking to Hillary Clinton, the first female presidential nominee of a major party, to win the White House and advance the cause of women's rights. A Clinton victory would end any doubts that women can achieve the highest summits of power and leadership. Some fear, however, that a Clinton loss could set back the cause of women's equality and perpetuate gender discrimination. Oct. 13, 1989 Should Women Be Allowed into Combat? Jul. 28, 1989 Do Pregnant Women Lose Legal Rights?